A synopsis of The Tales of Tiptoes Lightly by Reg Down. Includes age suitability, reviews, cover and a link to sample chapters and stories. Tiptoes Lightly lives in an acorn high in the branches of a Great Oak Tree. 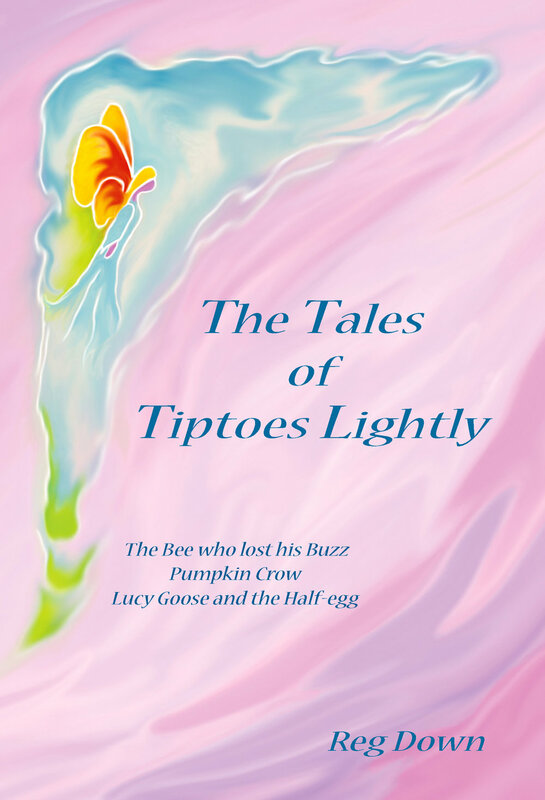 Her tree sits on a knoll overlooking Running River, and she and her friends have three adventures: The Bee who lost his Buzz, Pumpkin Crow, and Lucy Goose and the Half-egg. First they help the bee who lost his buzz – snagged on a thorn belonging to grumpy Mr. Cactus! Then they visit the house of Pine Cone and Pepper Pot and sail down to the sea to untangle Octopus – he’s too young to count his legs properly and gets them mixed up! Later they journey to the Snowy Mountains to hear from Jack Frost what kind of being he really is, and Jack tells the dramatic tale of how he came to be. Finally, after many adventures big and small they find out who the real mother of the half-egg is, the one Lucy Goose found in the mud and is determined to hatch along with her own eggs. Lavishly illustrated by the author-artist, these are simple, innocent and magical tales set in nature. Humorous, reverent, sanguine and droll, they are suitable for reading to young children (kindergarten to grade 3) or for young children to read (grades 1 – 4). Sample Stories: The Tale of Crystal Fire / Jack Frost's Tale / The Firefly's Story. Soft cover; 104 pages. Purchase Book. Also available in Spanish and German.